Reassembled, Slightly Askew whisked me off maternity leave with its Southern Irish debut in Sept 17 at the Dublin Fringe Festival, where it was lovingly housed at the fantastic multidisciplinary space at The Complex, led by Vanessa Fielding. It was nominated for 3 awards: Judges’ Choice, Best Design (Paul Stapleton) and First Fortnight. This led to it being programmed into three festivals in Canada: SummerWorks Performance Festival (Aug 2017, made possible with support from Culture Ireland and The MAC Belfast), High-Performance Rodeo, run by One Yellow Rabbit in Calgary, and the PuSh Festival in Vancouver, both for Jan 2018. I was also invited to represent Ireland at the PuSh assembly event in Jan 2017, pitching to international presenters (made possible by support from Culture Ireland and Irish Theatre Institute). I’m thrilled that after many years planning, Reassembled…. will be at Mount Sinai Rehabilitation Hospital this month as in-house training for its multidisciplinary staff teams. I’ve piloted this model during Reassembled….’ s five year development period here in Northern Ireland in the various health trusts and in partnership with Community brain injury support organisations. I have been commissioned to work with The Rainbow Project and TheatreofplucK to write an audio based walking tour of Belfast in which audiences hear the hidden stories of ethnic minority LGBT individuals in Northern Ireland, many of whom are refugees/asylum seekers. We piloted it at this year’s East Side Arts Festival and Belfast Pride and it will have its official premiere next year. The ever–resilient, always-visionary, Accidental Theatre company has commissioned me for their second Rapid Response play series. I’m writing a piece about Donald Trump, which is interesting, being an ex-pat. Starf*cker, which has been quietly under development since 2016 (with the support of Battersea Arts Centre in London and the MAC Belfast) , is going public at its first Scratch performance at the end of October at Battersea during the final week of a 3 week artist residency. It’s been such a joy to continue to collaborate with movement & music company Assault Events, as we began our relationship in 2010 working with text, movement & music. Like Reassembled… , Starf*cker is based in interdisciplinary collaborative creation, with a bit of the tech being unknown, but exciting–this time we’re looking at performance technology (video projection mapping, also with the reputable Dan Shorten) and social media to tell the live stories of stellar autopsy… more soon! While Reassembled…was on tour for 8 weeks around England with Battersea Arts Centre’s Collaborative Touring Network (Mar-Apr 16) , I had the pleasure of meeting Caroline & Jade at Darlington’s Jabberwocky Market, from which I’ve been able to provide mentoring to Jade on her new show about having Type 1 Diabetes. I’ve been invited to work with the lovely Jamie Starboisky, founder and queer visionary of Queer Media UK and its festival, and photographer Therese Frare on an amazing VR project looking at the full picture of the story behind this iconic photo Therese took of David Kirby and his family, published by LIFE magazine & used by Benetton to raise AIDS awareness. We’ve secured a residency week at the National Theatre (London) to begin our research and development process. I’ve had the great honour to be Artist in Residence at the MAC Belfast in Apr/May, and will return in Nov/Dec (this time with more childcare support during the week!) to be creating and collaborating furiously. Thanks to Reassembled…‘s director Anna Newell (2016 Ellen Stewart International Award Finalist for Artists and Theatre Companies Doing Socially Engaged Work with Youth), Reassembled… has been invited to be part of Battersea Arts Centre’s ‘A Nation’s Theatre Festival’ this Spring, 11-28 May. A Nation’s Theatre Festival is a two-month celebration of theatre from around the UK from April – May 2016. There are over 60 shows and events in the festival, across 17 London venues, performed by more than 350 artists from outside London. 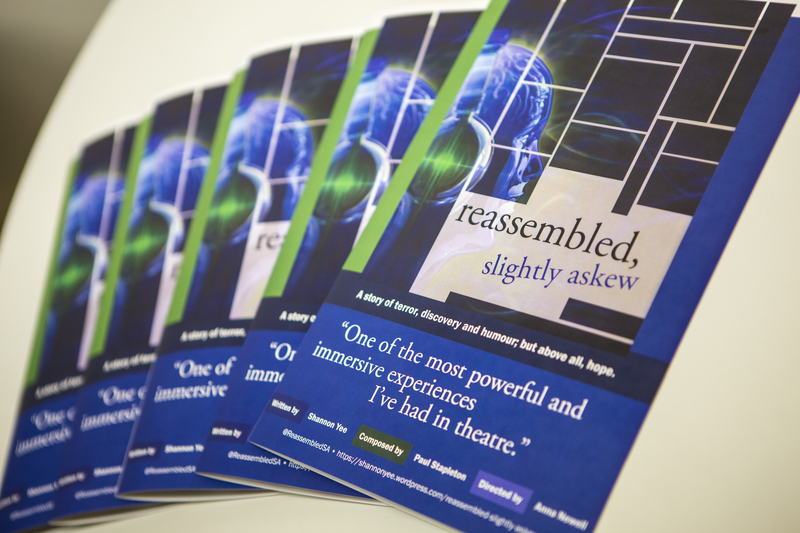 Reassembled… is the only production from Northern Ireland that is participating. How can we reverse the flow of theatre from London out to the rest of the UK? How do we encourage more arts provision outside of the capital? Tickets are available at www.bac.org. It’s hard to believe how long Reassembled, Slightly Askew has been in development, beginning with my personal experience in Dec 2008 (when what took precedent was surviving my subdural empyema) through today, when it has won numerous accolades across medical and arts settings, and plans are in motion for its London debut as part of Battersea Arts Centre’s ‘A Nation’s Theatre Festival’ in May. Dec 2008–One hour away from death from a subdural empyema. Admitted to Royal Victoria Hospital’s acute Neurosurgical Ward (Belfast). Underwent first craniotomy, involving bone flap being removed from skull and placed in subcutaneous pouch in abdomen. Three weeks later, regrowth of abscesses occurred, requiring a second surgery. Feb 2009— Discharged from Royal Victoria Hospital, still undergoing oral antibiotic treatment. Still with a section of my skull in my abdomen. Early Spring 2010— Met up with director Anna Newell to explore the prospect of creating something interdisciplinary about my experience of being ‘disassembled, and reassembled, slightly askew’, focusing on integration of movement (because of my hemi-paralysis down my left side) and sound (because of my noise sensitivity) with dramatic text. 2010— secured a Joint Sectoral Dramaturgy Fund grant (administered by Tinderbox) to work with the interdisciplinary artistic team to explore how binaural microphone technology, sound, choreography and dramatic text work together. Used a whole load of my journal notes and medical reports. 2011— secured an Arts & Disability Award Ireland (administered by Arts & Disability Forum) to do further research and development with the artistic team in Sonic Arts Research Centre at Queens University, Belfast. After creating a general 3-act storyboard of the story structure, we focused on the first act (or fog) to test out. Dramatic narrative, movement, sound, choreography and sonic arts had not yet been integrated in this rigorous way before, so we were not only creating the piece, we were creating the artistic language and conventions at the same time. 2012— Tested out Fog 1 at the Pick N Mix work-in-progress festival at the MAC, followed by a month-long stint at Arts & Disability Forum’s gallery space. 2013— Artistic reflections and meetings led to Shannon’s application to the Wellcome Trust Public Engagement Awards Small Arts Awards (£30,000), which was successful in May 2013, and enabled the artistic team to work with Shannon’s medical team to progress the project. 2014— Shannon was successful in her application to the MAC to be a Hatch-supported artist, giving her space in the building, support from the staff, a small stipend, and time to bring the project to the next level with focus groups of arts professionals, healthcare professionals, neurosurgeons, and the general public as the artistic team continued to work through the creative process. After many rewrites and sonic revisions, with the input of the medical professionals, the entire audio artwork was finished in December. 2015— Shannon secured another Arts & Disability Award Ireland grant, the Hatch residency continued, and Reassembled, Slightly Askew had its world premiere at the Cathedral Quarter Arts Festival at the MAC. 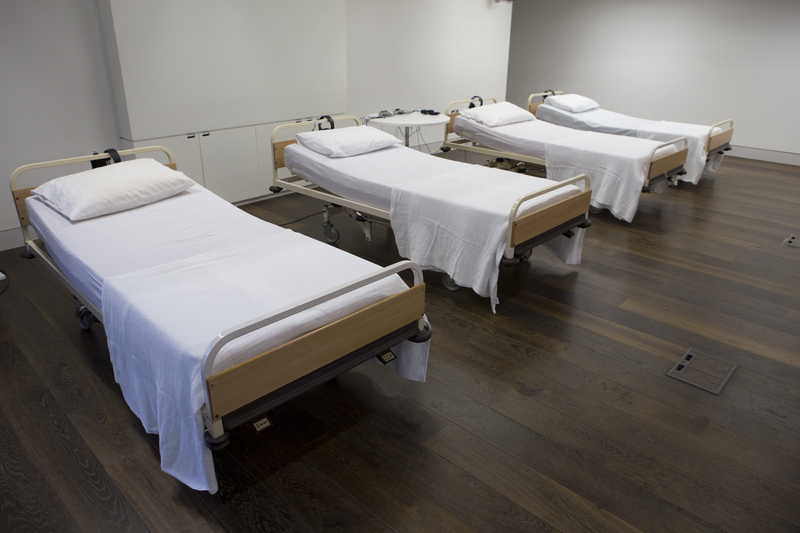 It sold out at CQAF, then headed out on a five-venue tour across Northern Ireland (courtesy of a partnership with Cedar Foundation and a grant from the Arts Council NI) to broaden not only an understanding of disability, but also what theatre can be — in a hospital bed with headphones. In addition to overwhelmingly positive responses from audiences, it secured at 5 star review in The Stage (written by Jane Coyle). It finished it’s NI tour in September at the Arts & Disability Forum’s BOUNCE! Festival at the Lyric Theatre. Wellcome Trust funding finishes, as does Shannon’s Hatch residency, but she secured an Arts Council NI/British Council Artist International Development Fund award to build international networks for Reassembled… in New York, Boston/Cambridge, and DC. The next steps for Reassembled… involve outlining the various performance models (conferences, medical training, contemporary art gallery settings, festival venues outside NI) and building the infrastructure to not only support its longevity as an artistic piece that has had great success, but also my longevity as an artist with a disability. A wonderful end (or new chapter?) to a harrowing experience that began more than 5 years ago. focus groups of Neurosurgeons, nurses, health professionals, arts professionals, people who have disabilities. Delighted to be part of the Arts & Disability Forum’s 2015 BOUNCE! festival. ADF has been a tremendous support over the years, not only to the development of Reassembled, Slightly Askew (beginning as Recovery), but also to my own journey of owning being an artist with a disability. An interview by Anna McNay for Studio International. Reassembled, Slightly Askew had a tremendously successful inaugural tour around NI from late April through early June, at the Metropolitan Arts Centre (as part of the Cathedral Quarter Arts Festival), Derry Playhouse, Flowerfield Arts Centre (as part of Action on Brain Injury Week), The Burnavon, Down Arts Centre and Island Arts Centre. After a much-needed break for the summer, it will be returning to Belfast as part of the Arts & Disability Forum’s BOUNCE festival, 3-6 Sept at the Lyric Theatre.